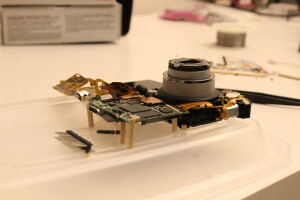 I’m currently working on a project involving a Canon ELPH100HS point and shoot camera and my first task was to tear it apart and find any low level hardware access that I could. 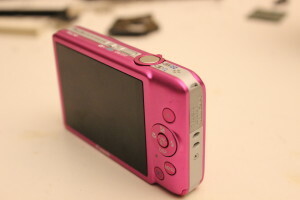 I chose the IXUS115 mainly for it’s full 1080p video recording capabilities and there is a CHDK port for it, which, it was hoped, would make the reversing and hacking process easier. I was hoping to find a serial console port and JTAG access to the processor, to aid programming and debugging. Before I can start searching for hardware access, I need to get under the covers. 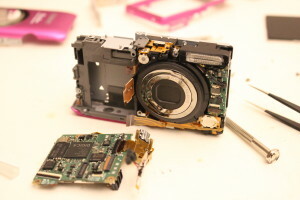 The screwdrivers came out and the camera was disassembled with a minimum of fuss. On the PCB was a footprint for a connector that wasn’t populated, but most of it’s pins were broken out to test points. This is where it started to get fun. Some quick inspection identified a no-connect pin, ground, what looks like two supply rails with one missing a connecting component, and a variety of signals. 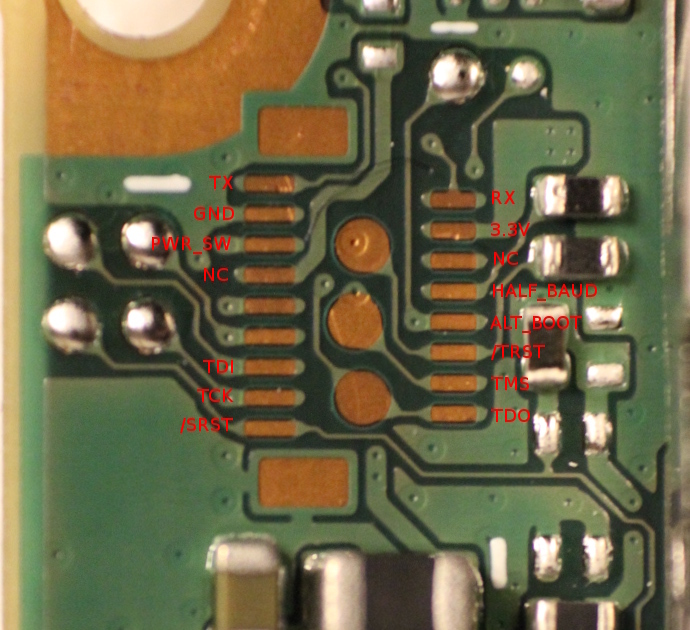 Thanks to CHDK I knew there was more than likely a serial port on this connector and some quick probing with an oscilloscope revealed that pin 1 was TX and pin 2 (bottom left) was RX. Objective 1 complete. While a serial console on a point and shoot camera was fun (see Event and DryOS shell for what can be done with it) I wanted lower level access. 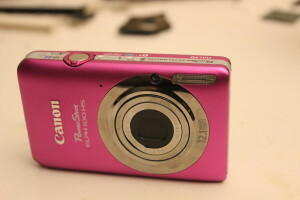 I had to make it easier to hack on the camera as that connector was tiny and impossible to work with for any length of time. 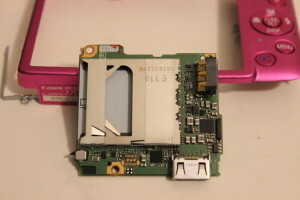 I was convinced that there was more to this connector, Canon have to get a bootloader onto the board one way or another, and without code, the serial console doesn’t work. 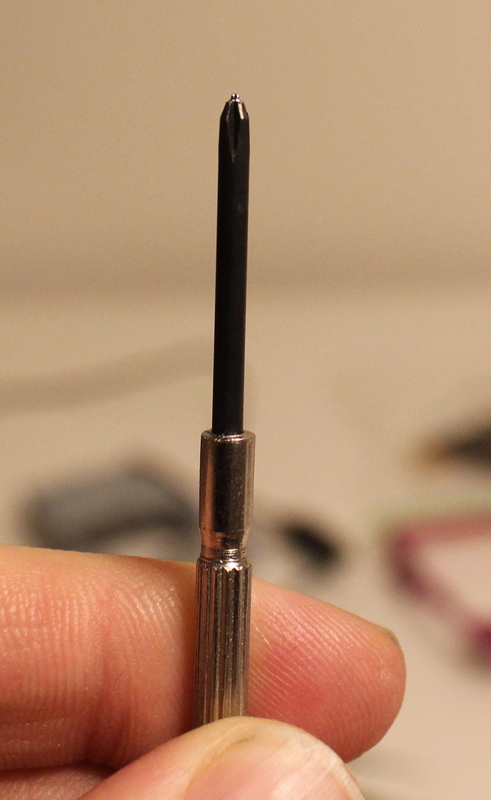 Using some 0.1mm enamel wire and a magnifying glass, I managed to get all the connections out onto a standard 0.1″ header strip. A bamboo skewer, a takeaway lid and a bit of glue later and I had all the camera parts securely mounted and accessible. 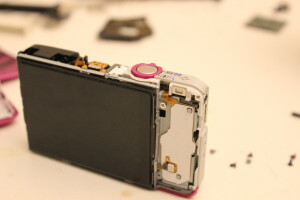 The memory information shown above will come in handy later when reversing the firmware. I may be able to use the xd/xm commands to query the Flash over CFI and determine what it is, the markings on it bring up no results. Now that the pins were all nicely accessible and I had a serial console, it was time to figure out what they all did. Taking SHDN high caused the camera to turn off gracefully, taking /OFF low immediately turned the camera off, no lens retraction. All the rest of the pins were either inputs or high impedance outputs. 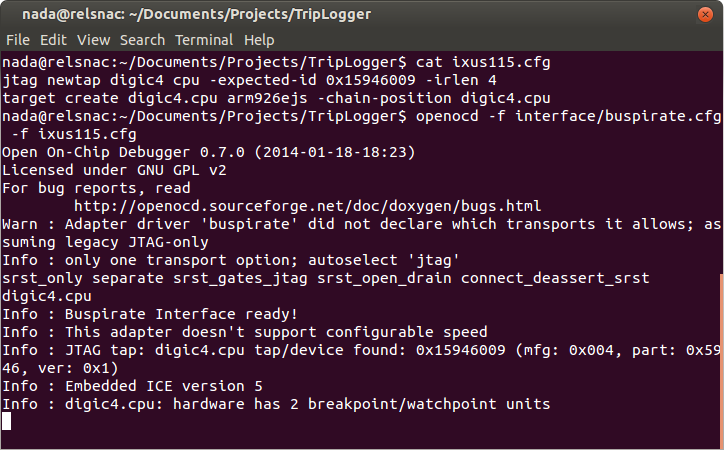 Having learnt a little more, I thought it was time to hammer on JTAG and see if I could find a chain. Using a STM32F3 development board and a utility of my own making, I hammered on all 9 of the unknown pins to see if JTAG showed up. It didn’t. It allows for 8 memory and bus checks to be performed. An interesting note about this mode is that the power switch has to be held down, otherwise the board turns off. I’d reduced the candidates, but still hadn’t found a JTAG port. I also tried different combinations of power up modes to see if it was being disabled on startup. Yup, it’s all working correctly. JTAG found. 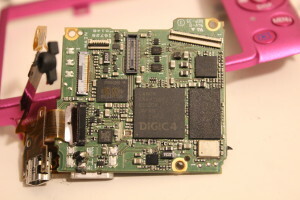 So, why the desire for JTAG? JTAG allows me to debug code (very slowly) on the processor instruction by instruction and gives me runtime information on the firmware, something that a static analysis can’t. 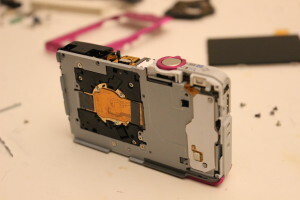 I’m also able to program the flash, change things as I see fit, and recover if I brick it. I rolled my own JTAG finder instead of buying one of the readily available ones (JTAG Enum, JTAGulator, etc) as they are expensive, a dedicated solution and/or require additional hardware I don’t currently have. Rolling my own on a dev board makes it useful, keeps the dev board available for other tasks and taught me a heap about the workings of JTAG. Oh yeah, and all it cost was time, which would have been spent waiting for the post. Doing a bit more testing on the pins, I’m fairly certain that /OFF above is actually /SRST (system reset) which promptly disables the power. SHDN above is probably the power switch, as it has similar behavour and if it’s held high on boot, the device won’t turn off. 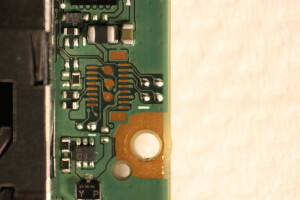 The pin below SHDN is probably a power supply pin (due to the wide trace) for development use, allowing the developers to power, control and debug the board from a single connector. As it’s not needed for production use, the linking component was not populated, but it can easily be replaced with a solder bridge. This is something for me to try in the near future. 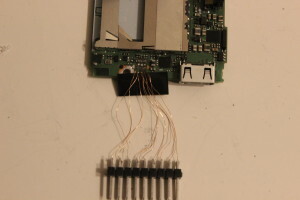 Finally the two unidentified PD pins could have something to do with the ARM Embedded Trace Macrocell, possibly an enable and return clock (RTCK). 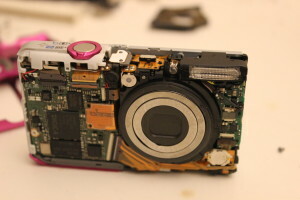 I’m fairly confident that the same connector would be on all Digic 4 cameras, and it’s probably similar across most of Canon’s range of point and shoot cameras. 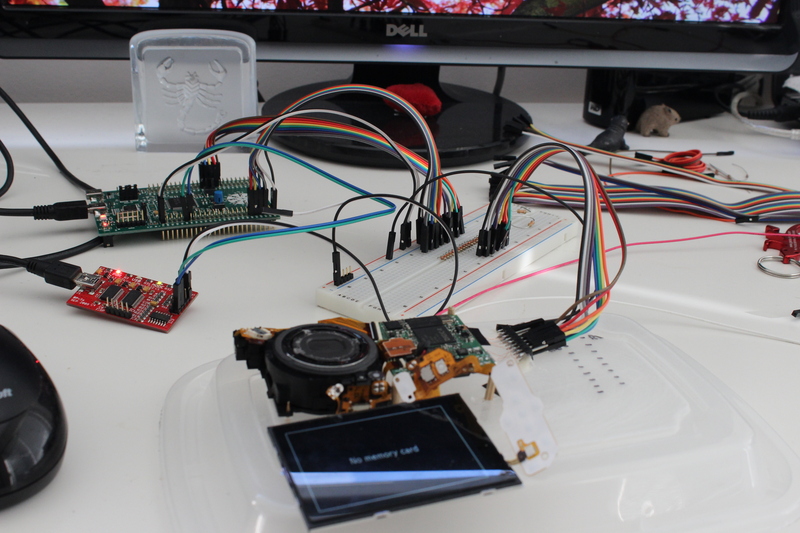 The next step is to improve JTAG Knocker to the point where it’s ready for release as a functional JTAG finder and USB based JTAG adapter for OpenOCD. The JTAG adapters I currently have don’t support TRST or SRST and I may be able to roll some other functionality in there too. The board definition file for the camera also needs some work, GDB has a few issues and there are currently no memory regions defined. This entry was posted on March 4, 2014, 7:43 pm and is filed under Hack. You can follow any responses to this entry through RSS 2.0. You can leave a response, or trackback from your own site. Hi, thank you very much for your article. The pinout is the same on my camera for JTAG (PowerShot S100), as for UART I didn’t test it.